The ultimate joy of reviewing new albums is occasionally getting totally besotted by the first listen. 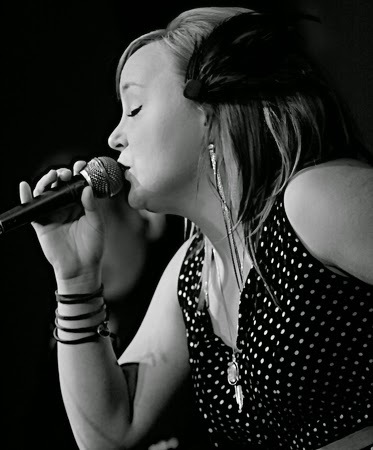 So without delay, let me share the pleasure of discovering the gutsy and powerhouse sound of Samantha Martin. Technically this is not the first listen to Samantha’s music as there is a vague recollection of catching part of her Sunday morning gospel set at the 2013 Calgary Folk Festival but this casual acquaintance at a crowded event has now exploded into a full blown love affair. SEND THE NIGHTINGALE is the guilty party for this new found obsession and rips right through you with a lightning streak of what makes blues, roots rock and soul music so accessible to listeners desiring an alternative music exposure. 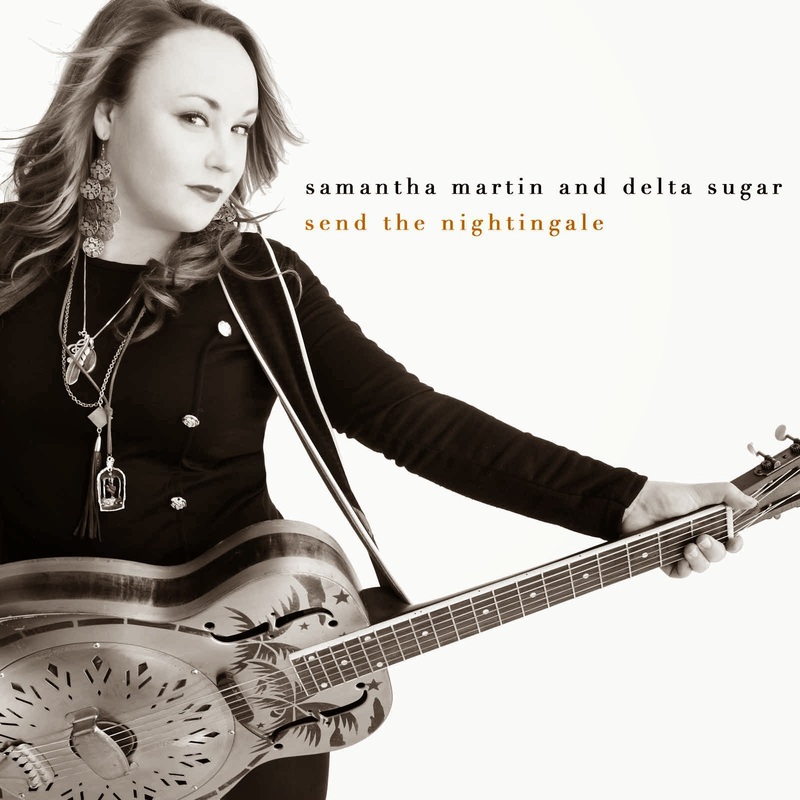 For this album, which is now available to download in the UK, Samantha has assembled a three piece backing unit creatively named Delta Sugar. This combo of Mikey McCallum on electric guitar alongside Sherrie Marshall and Stacie Tabb on backing vocals help Samantha create a wonderful rounded listening experience, with additional organ by Jimmy Hill taking you on a journey deep into the inner sanctum of your musical mine. Right from the spine chilling opener ‘Give Me Your Mercy’ (don’t forget to sample the Sound Cloud link below) through to the deeply spiritual closer ‘Tell the Heavens’, the album will make you shudder, extract every sinew of raw emotion and leave you blessed with an experience of exploring what makes music an important medium for self-expression. All eleven tracks on the record are originals from a multitude of writers including Samantha on eight of the songs. ‘Mississippi Sun’ first appeared on an EP in 2014 and anchors the second half of this record with a sound that reaches out right across the wide roots spectrum even wandering into country territory. Of course by the very nature of its title, southern influence is a major feature of this track and indeed many others which shows Samantha’s desire to spread out from her Toronto base and soak up the special sounds that span a continent. Primarily the mood is driven by a passion to interpret the blues and its soulful cousin with Samantha expertly achieving this in a highly palatable way. There is not a single track on the album with a mere minimal effect and ‘When You Walk Away’ will leave you in a temporary state of melancholic despair (in a good way though!). The most appropriately titled song on the album is ‘Addicted’, a state further enhanced by multiple listens to the drooling number ‘My Crown’. Apart from Samantha’s thumping vocals and the ‘to die for’ harmonies’ , sterling guitar work surfaces on ‘Don’t Shoot’ and the slight rockabilly influenced rolling number ‘One More Day’. Going back to the wonderful harmonies, they are no richer than heard on the strong chorus featured in ‘Take Us Swiftly Home’, while Samantha manages to dig even deeper into her vocal armoury to belt out the slower paced ‘I Won’t Justify’. This whistle stop analysis of the songs ends with the pure golden soul dripping out of ‘Won’t You Stay’ with visions of its singer pleading on her knees accompanied by a stripped back sound. Official publicity have likened Samantha to Mavis Staples and Sharon Jones, so take a listen and see if you agree. Either way the process of accessing the sounds emanating from SEND THE NIGHTINGALE by Samantha Martin & Delta Sugar is one not to be missed. Feel free to choose your own stand-out track from the many on offer, however this review is signing off with the simple statement that this is a ‘stand-out album’.